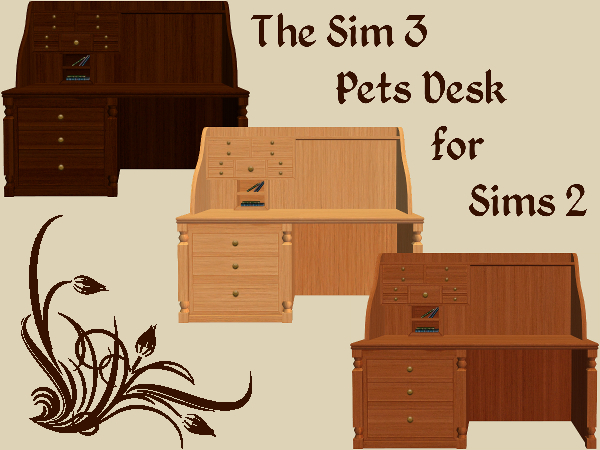 3 recolours of 'The Sims 3 Pets Desk For The Sims 2' converted by TheNinthWave, using Apartment Life Wood Colours. Big hug and many thanks to Jon for converting this desk. MESH IS INCLUDED, you can view the original conversion HERE. All files have been compressed and checked in game. Let me know if you find anything wrong with any of my work, so I do not make the same mistake in the future. Constructive criticism and feedback are always welcome. I do recolours and design my lots for pleasure, not for profit. Feel free to use my recolours and include them in your lots, uploaded to free sites only. However, remember to check the original creator's policies and always link to the originals. DO NOT re-upload to pay sites or the exchange and DO NOT claim any of my work as your own. I reserve the right to change this policy, at any time, without notification. ~Take care and stay safe. Looks great Michelle, I know you put a lot of hard work into it.